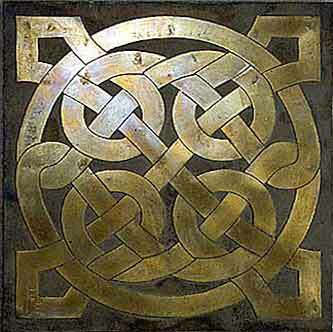 This bronze tile is deceptive in it's simplicity. The flow and the boldness of it make it appear as if it's a reasonable and logical progression of a repeated pattern, but in the design phase I discovered that there is just one way this works. Any line that isn't exactly precise will throw the whole design off. Because it is this precice, any deflection stands out like a sore thumb, and because of the flow and weave of it any change in width of the bands affects the entire visual balance and the knot tends to look somehow distorted. The squareness of this knot lends itself to a lot of applications where balance is important, and it can work well both as a straight up and down tile in a field of other tiles, or mounted diagonally as an accent piece on a wall, for instance. If this is the tile you choose to enhance your hearth, kitchen, entrance way, driveway, or living room wall, I'll need to know how you want to set or mount it. The base, minimum, thickness of this tile is about 3/16" and typically needs no stubs on the back to bring it out to the 1/4" thickness that is the most common tile thickness. For applications requiring a deeper tile, though, corner stubs can be added to hold the tile up higher. There is an additional charge for this, though, and the options and the current pricing schedule for this will be found on the main Celtic Tile page.